A massive well done to the staff members, friends and family who made up the Magee Gammon football team and who took part in last Saturday’s annual CaseWare charity football tournament. They all played brilliantly and for the second year running came third overall taking home bronze medals – narrowly pushed into third place by the smallest of margins – just 1 point! As usual. and seemingly now a yearly tradition they lost their first game – mainly due to not knowing each other’s names! but quickly turned it around and ended the day with a respectable 7 wins, 1 draw, and only 2 losses in total. 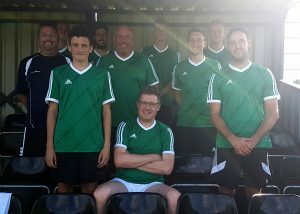 Big congratulations to Chavereys who beat Sargeants in the nail-biting penalty shoot-out, proudly taking home the trophy, although the moral victory was ours, by beating Chavereys in the group stage! Well done to all who took part and for raising an overall £1373 for charity. Go team!